As each DALI line is limited to a maximum of 64 devices, it is common that more than one DALI line will be required on each floor. Commonly, floors are broken into a number of different sections containing up to 64 DALI devices. Each section is then wired back to the communications room located on the same floor. As a DALI device is galvanically isolated, each DALI device can be supplied from a different electrical supply circuit or even a different phase. This means that wiring a DALI line does not have to take into account the layout of internal subdivisions. 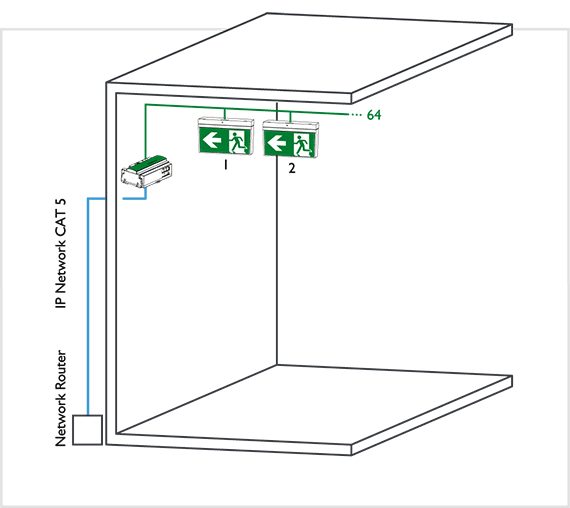 Typically the DALI control system will have a connection box located on each floor to reduce the required wiring. 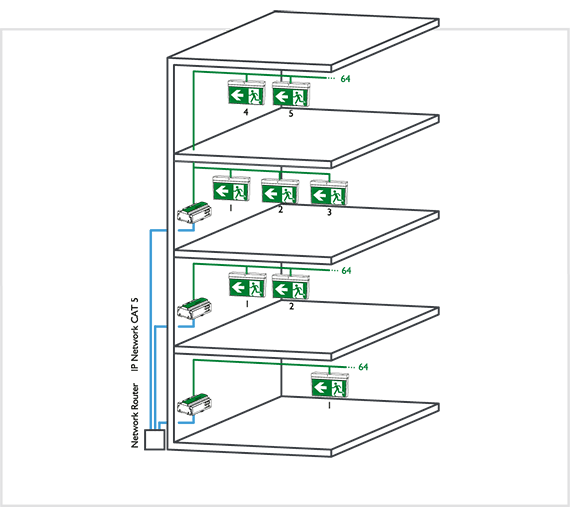 A connection box will have two separate communication zones, one dedicated to the DALI protocol to talk to all DALI devices on the connected line(s), and the second to use the manufacturer chosen protocol(s) to connect the connection box and the control system together. HINT: For true DALI compatibility try to choose a control system which allows for other DALI controllers to be placed on the DALI line. This will allow for the greatest capability and can lower the future costs when change occurs, this is referred to as a multi-master DALI system. NOTE: TCP/IP or Ethernet is Ektor’s preferred choice for connecting multiple DALI lines together, as it is fast, efficient and can even use a shared communication backbone. Preference is given to Ethernet, as the combination of DALI & Ethernet can provide almost every option or control available on other system. Also these other systems ( like KNX or BACnet) tend to require both DALI and Ethernet to perform the same tasks. Using Ethernet & DALI properly removes the need to wedge a third protocol in between two perfectly suitable and capable systems, and thus reduces complexity and overall cost of the system. The DALI Protocol is designed for a small collection of DALI devices, up to 64, on a single line. The DALI devices on the line can be controlled as a group or individually. Only a DALI controller connected to the same line can control the associated DALI devices. Because DALI is limited to 64 devices per line, a control system is required to link more than one DALI line together. Depending on the design of the control system, unlimited numbers of DALI lines can be connected together allowing for easy control of building lighting.